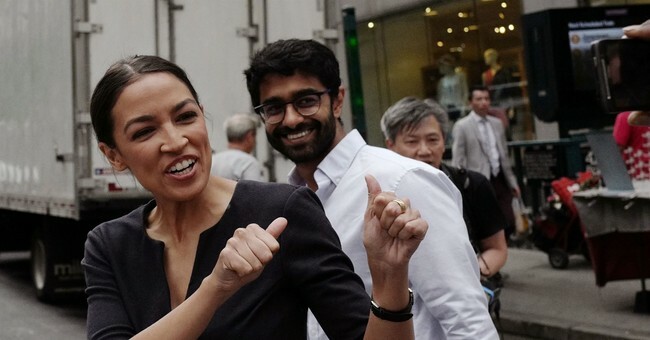 The recent Democratic primary win by “Democratic Socialist” Alexandria Ocasio-Cortez in the safely Democratic 14th congressional district of New York is being presented by the liberal media as something stunning and new. It isn’t. DNC chair Tom Perez even said in a recent interview that Cortez represents the future of the Democratic Party. She doesn’t. She represents the Democratic Party’s present. During the 2008 presidential election, when socialism was still taboo, politically speaking, people on the right who suggested Obama was a socialist were ridiculed and derided by the mainstream press as conspiracy theorists, or even targeted for destruction. Does everyone remember how “Joe the Plumber” suddenly became the story the media decided to investigate instead of Obama’s “spread the wealth around” comment? Do you recall that his tax history was even leaked to the media? Socialism was a dirty word back then, and anyone who uttered it aloud felt the full force of the “Hope and Change” collective. Then the 2016 Democratic primary happened. To whom did the Democratic Party’s base flock? The establishment Democrat, or the “independent” candidate openly espousing socialism? The mask finally came off. Uncle Bernie promised “free” healthcare, “free” education, “free” housing and more, all at the expense of “rich” taxpayers, naturally. Democratic Socialism, which is also known as Socialism, was suddenly cool. Bernie even got a chance to explain it to Larry David on Saturday Night Live. Bernie was saying out loud many of the things people on the left have been thinking for years. By the time the 2016 Democratic National Convention took place, the party had been split in two. Supporters of the establishment sat inside and listened to speeches, while the base of the party was outside, storming the gate, demanding everything on Bernie’s list and more. Which side do you think Alexandria Ocasio-Cortez represents? She had the full backing of the Democratic Socialists of America, who recently demanded on Twitter, the abolishment of profit, prisons, cash bail, and borders. It’s fascinating how that platform overlaps with rhetoric we’ve heard from not only the DSA, but also Antifa, the Occupy movement, Bernie Sanders supporters, and hosts on MSNBC. Many talking heads in cable news feigned surprise over the election of a socialist in a Democratic primary, but anyone who has been watching the Democratic Party for the last decade knew this is exactly where it was headed. Shortly after Obama became president, Newsweek proudly declared on its cover that “We’re All Socialists Now.” Were people not supposed to notice that the media had signed on to the new plan and were even anxiously promoting it? Democrats are literally betting the house on this. They now routinely appear on cable news demanding the abolishment of ICE, while simultaneously insisting upon “free” healthcare and higher education. Where do you think these talking points come from? It’s not Tom Perez or the DNC. He and other Democrats take them from leftist activists who belong to organizations like the Democratic Socialists of America. Instead of trying to appeal to the voters they lost in the 2016 election, Democrats have doubled down on leftism and are fighting to keep their base, which wants nothing short of full socialism. The hard left has been working and building towards this moment for years, which is precisely why so many of them are acting out so violently now. With Obama’s election in 2008 and reelection in 2012, they thought the country had finally shifted permanently in their direction. Trump’s 2016 victory was proof of their error, which they simply cannot accept. As a result, we’ve had riots, intimidation of Electoral College members, accusations of fascism, the Mueller investigation, a litany of insults from Hollywood, and worse. At the root of this rage is the base of the Democratic Party and they are socialists. They will settle for nothing less than “free” everything, and they expect you to pay for it. Alexandria Ocasio-Cortez is not an anomaly. She is the natural result of the political trajectory Democrats have been following for years. No one should be surprised by her win or the media’s glee over her arrival in American politics. Socialism is not the Democratic Party’s future. It’s where they are right now.